Got home a couple of hours back and was amazed to see the job complete – Thank You! Really pleased with the finished article. 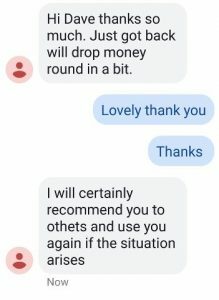 I’ve made a bank transfer as per your invoice, it should be in your account sometime tomorrow – hopefully morning, I was to late to get it out this afternoon. Very many thanks for undertaking the repointing of our side of the boundary wall at our home along with the repointing of the side of the Air Raid Shelter. Both areas have been completed to the highest standards and the skill with which you have been able to repair and tidy the Air Raid Shelter wall is such that, had we not known, we would not have believed it to be the same wall! Your highly professional yet friendly approach, from start to finish, has also been very much appreciated. We would certainly ask you to undertake further work in the future and also recommend you to our friends and relatives. We wanted to extend our garage, so at the time were looking for a small builder to carry out the work. 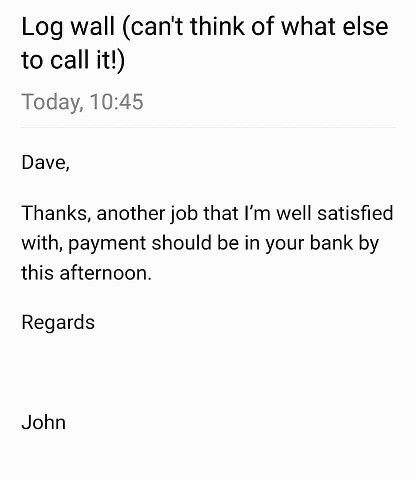 After contacting numerous builders who did not respond, we found Dave. 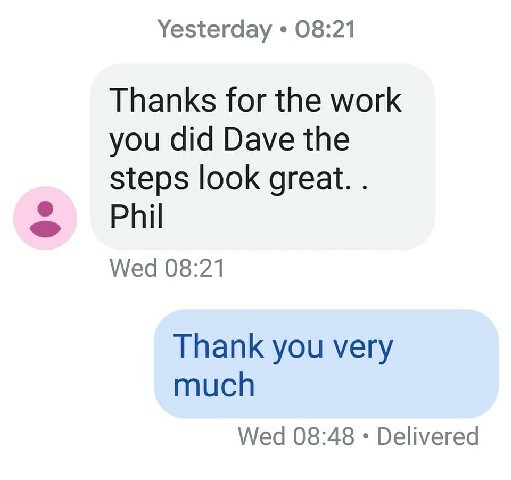 Dave came across as being someone very knowledgeable polite and professional, who during the planning stage came up with alternative solutions that were easier to manage and cheaper. The finished extension was perfect, and it is hard to distinguish from the original build, this being due in part to Dave’s excellent brick laying skills. 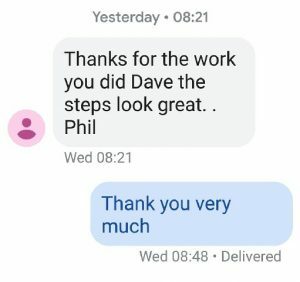 Dave is very punctual, trustworthy and pays a lot of attention to detail, as well as ensuring that the build area is clean and tidy, there was never a time when building materials were left lying around. We found that Dave’s professional approach to his work and his experience made this project easy to manage. We would have no hesitation in recommending Dave to carry out any building work, and we certainly will call on him again if we have any building work that needs to be carried out in the future. Dave has completely re-built my garden from scratch with a new fence, patio areas and lawn complete with edging. He was able to create exactly the look that I had in mind and the quality of the work is second to none – I now have a beautiful outdoor living space to enjoy this summer. 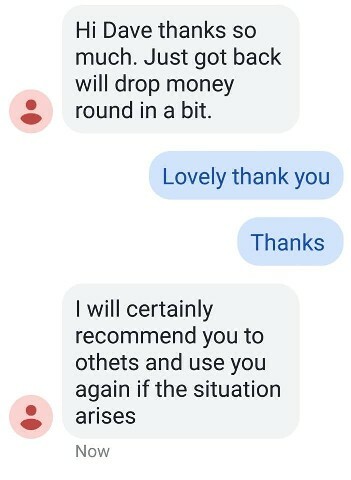 I would have no hesitation in recommending Dave to anybody looking into any type of home improvement or repair – not only for the workmanship but also for his honest and fair pricing and excellent reliability. Thought we would just let you know how very pleased we are with all the jobs you have done for us this year, especially the paving at the back of the house which makes everything look so smart. We will certainly have no hesitation about recommending you to anyone who asks us if we know a reliable builder! These days so many people you contact to do some work either don’t even come to look at the job in the first place, or having been given the work are just not that reliable or even very good at things! It’s therefore a great relief to find someone who is not only good at what they do, but also punctual, hard working, and, importantly, doesn’t rip you off. Rest assured, we will be in touch next year! 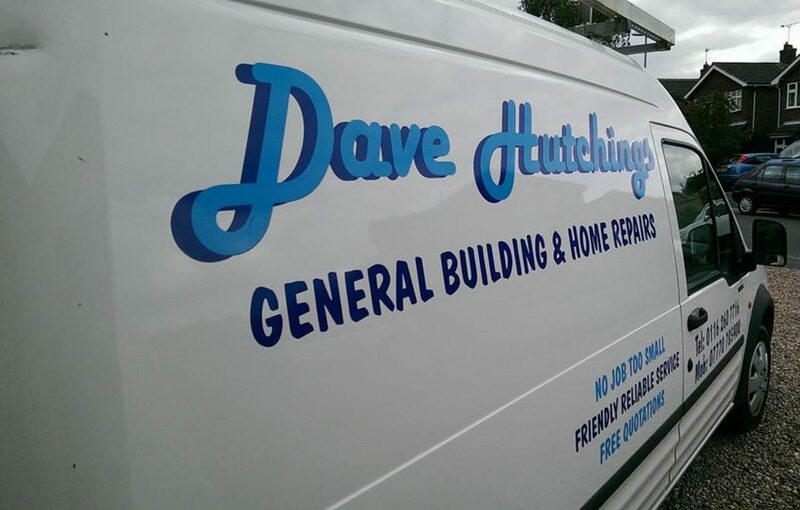 Over the last few years I have had Dave fulfil several jobs for me ranging from replacing ridge tiles, fitting a new power shower and pump, installing a new kitchen sink unit and taps and fitting an outside tap. 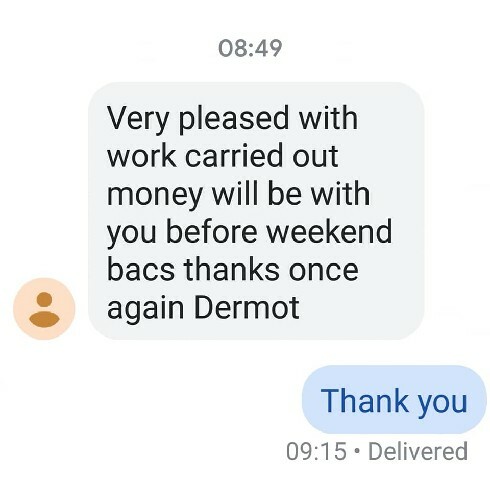 I have always found him to be punctual, polite, efficient and professional in every way and has always left the site clean and tidy on completion of every job. 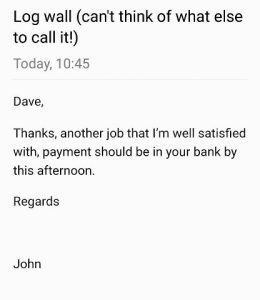 I would have no hesitation in recommending Dave as a first port of call for any building work that may be required in and around your home. Dave is highly skilled, conscientious, trustworthy and friendly. He listens to what you want and will not try to make the job bigger than it is. I would recommend him to anyone. many thanks for the building of my BBQ.First time i have used you and i am well impressed.Started on time at the appointed day and worked non-stop till the BBQ was finished. Excellent workmanship and would recommend you for any jobs big or small.Will definately use you again when needed. Since moving to Syston 4 years ago,I have had Dave to do several jobs for me including. Lay a complete new path. Level & lay slabs for a garden shed. Lift and re-lay existing paving to another level. Widen existing path to the side of the conservatory. And the latest job was the complete instalation of a multi fuel stove and associate work of the stove pipe and finishing the fireplace up to plastering. We have found Dave to be pleasant and willing to please on all occasions. we would definately reccomend him for any building work that needs to be done.